What you will find here is Yellowstone news that I have compiled from news gathering, government, activist, and blog sources. 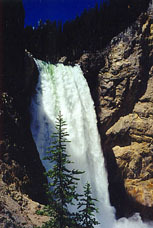 For further factual research, see The Magic of Yellowstone Fact Guide or History Guide. Read all December 2006 Yellowstone News. Looking for a seasonal job in Wonderland? This is a great place to start. 1/17/07 Protecting the environment through the ownership society -- Part II (press release by National Center for Policy Analysis)--you can also read the full report. It diagnoses things very differently than I did in an essay I wrote today. I also wonder about the release of this in conjunction of the timing of the AP story on the NPS looking for more private funding. I offered a bit of a response on 1/18/07. 1/8/07 Council looks at high speed rail (by John Morgan Casper Star-Tribune)--high speed rail to Yellowstone? 1/16/07 Rave reviews from complimentary trips (by Yellowstoner)--seen all the positive stories about snowcoaches? 1/8/07 Here's your sign! (by Tom Goodrich Wild West)--another firsthand trip report. I try to publish these if they go on more than a few paragraphs and share something telling about the park experience. Copyright 1999, 2002-2003, 2006-2007 James S. Macdonald Jr. However, what's mine is yours.